Five years turmoil in the Middle east region of the world is heading to no solution. The conflict in Syria due to ISIS terrorist organization rose to uproot the regime of Baser-Al-Assad. This conflict of more than 5 years has resulted in disastrous outcomes for people of Syria and the neighbouring countries- Turkey and Jordan. It has also affected the demography of the European nations accepting refugees on large scale. The Syrian Center for Policy Research in February 2016 documents claim that more than 470,000 people died and more than 1.9 million get injured since the outbreak of civil war in March, 2011. The catastrophic situation has impacted the life expectancy, dropped from 70 to 55.4 in these years. Millions of migrated to other countries and living in camps under life threatening conditions. The religious composition of Syria is complex. Out of 23 million people, Arab Sunni consists of 60 percent; Alawite Shia consists of 12 percent; Christian 13 percent; Kurds 9 percent; and other 6 percent. There is no democratic government due to civil war broke out in Syria. President Basar-Al-Assad belong to Alawite Shia community ruling it with military power for many years. 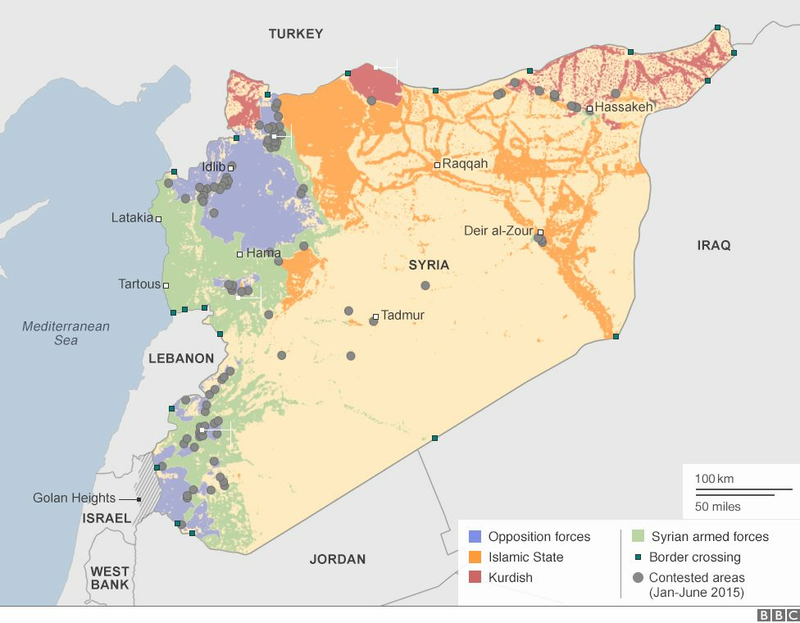 Syria crisis started in March, 2011 as a spillover effect of Arab Spring (aroused in 2010-2012 to uproot the corrupt and oppressive political regimes of Arab nations). It was first started in Tunisia in 2010 known as 'Jasmine Revolution', and in Egypt is known as 'Lotus Revolution'. This reached to different middle east nations like Libya, Bahrain, Yemen and Syria. It was initially supported by many scholars and intellectual and called it necessary step to establish a democratic government in Arab nations. But, it took a catastrophic turn in Syria where the largest battle to uphold power is going on. Groups like Al-Nusra front and Syrian Army (rebel groups) demanded the restoration of democratic rights and representation of their community in the government. This movement was supported by other neighbouring countries like Saudi Arabia, Turkey and their western allies like US and European Union. But, the president of Syria- Basar-Al Assad had well organized military which was used to crush these rebellion groups. The dominant sunni states like Saudi Arabia, Turkey are opposed to it. Thus, they supported Sunni rebellion and other groups of Syria against Shiite Assad regime. Shia-Sunni conflict got worse after the fall of Saddam Hussain regime in Iraq after US war. US wanted to install anti-Saddam Shia government in the region, which again become bone of contention among the middle east nations. This situation gave rise to ISIS (Islamic State of Iraq and Syria/Levant), an international terrorists organization, in June 2014 under the leadership of Abu Bakr Baghdadi. He and his army captured the region of east Iraq and west Syria and declared himself as Calipha of new Islamic state. Islamic state emerged in the wake of 2003 war of US on Iraq. It was led by Jordanian militant Musab-al Zarqawi and headed Al Qeada in Iraq. Zarqawi was killed by US forces in 2003 only, but his successors remained active who captured large part of Iraq and Syria and named it Islamic State in 2014. It has been estimated that it has an army of 13000 and another Sunni militant group of the region, linked with other terrorists organization of the world. Due to their heinous war and crimes on people and other activities in Western countries, it has been now in the battle with USA and its allies, and Russia. The dramatic turn took place in September 2015 when Russia, supporter of Assad regime in Syria declared war on ISIS militant group. Since, rebellion groups like Al-Nusra front and Syrian Army have been supported by Saudi Arabia and Turkey, they have objected the intervention of Russia forces in Syria. Although, Russia has claimed to only war with ISIS militant group in west Syria near Latakia. Under the non-productive war situation, a peace process was started by UN in Geneva, called Geneva I conference on Syria in 2012. UN had sent the peace envoy, Kofi Annan to Syria in 2012 but no productive outcomes was happened. Second conference on Syria held in January, 2014 called Geneva II conference on Syria to discuss the solution of Syria and its people. It was backed by 20 nations group called International Syria Support Group (ISSG) in the support and against of Assad, co-chaired by Russia and US. ISSG was come to know after Vienna Peace talks for Syria held in November, 2015. The fourth attempt was made in February, 2016 with third peace talk in Geneva. known as Geneva III conference on Syria. The talks held between ISSG and UN security council. UN special envoy for Syria Staffan de Mistura invited the Saudi Arabia-backed coalition of 34 groups, the 'High Negotiation Committee' (HNC), which did not include Syrian Kurdish groups; he also invited some moderate opposition members, supported by Russia but not part of the Saudi-backed coalition. The exclusion of the main Syrian Kurdish party, the PYD, from the talks was in line with Turkey′s objections to their participation. Germany has declared the ceasefire to alleviate the situation and on the line of it, Russia has also declared ceasefire and humanitarian supply will be resumed. Russia has also clarified that ceasefire is not for IS group and Al-Nusra front. Lately, the situation has got aggravated when Kurd in the northern region of Syria, bordered with Turkey declared an Autonomous Federal region. It has been condemned by US, Tukey and Assad government. The Syrian situation is like no-win situation where Shia-Sunni try to reinforce each other in the Middle East region. Whereas, Assad government has military support with all resources trying every possible effort to suppress the non-united rebellion groups lacking resources and military capability. Comments "All you need to know about the conflict in Syria"